N. STONINGTON – A concert by the L.U.N.C.H. ensemble and sponsored by the Students in Action group at Wheeler High School, was well received Friday night with more than 150 people in attendance. 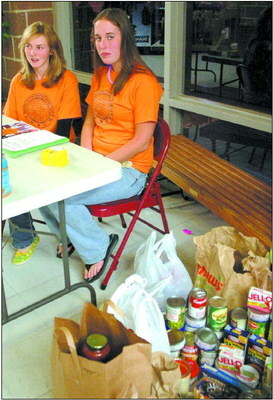 The performance generat­ed approximately $ 2,000 in funds, in addition to several hundred items of canned goods. The non-perishable food items collected, and half of the proceeds, will be donated to the Pawcatuck Neighborhood Center with the balance going to other local agencies, according to group founder Bill Pere. 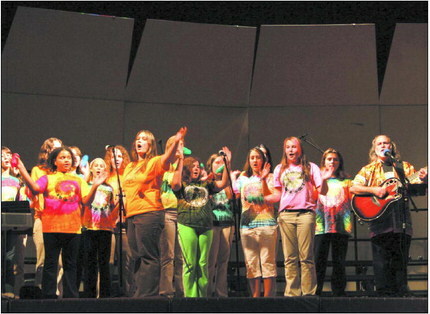 L.U.N.C.H., an acronym for Local United Network to Combat Hunger, is made up of professionals from the Connecticut Songwriters Association and about 30 students from fifth to twelfth grades in Connecticut and Rhode Island. The group performs throughout the two states in an effort to raise money for social service agencies. To date it has raised more than $ 700,000 and has involved more than 2,500 kids in its efforts. Members of the Wheeler High School and Middle School Choruses join Bill Pere and the LUNCH Ensemble for the Hunger Awareness Concert at Wheeler High School. 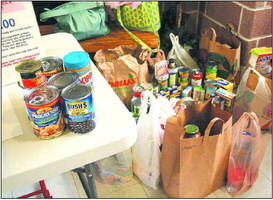 Some of the canned goods donated at the Hunger Awareness Concert at Wheeler High.